Why doesn’t the Jungle Cruise have a Christmas season overlay? Every year at Disneyland the Christmas decorations go up for the holidays and even some of the park rides and attractions get into the Christmas spirit with special theming. The fireworks show becomes “Believe…In Holiday Magic” and concludes each night with magical Southern California “snow” falling. The Haunted Mansion is changed into the home of Jack Skellington for a “Nightmare Before Christmas”-style “Haunted Mansion Holiday”. Santa’s Reindeer Round-Up can be found at Big Thunder Ranch. Even the ever-singing tiny dolls in “it’s a small world” add Christmas carols in a multi-cultural holiday celebration. But each year at Christmas time, Adventureland’s oldest attraction gets left out of the festivities. 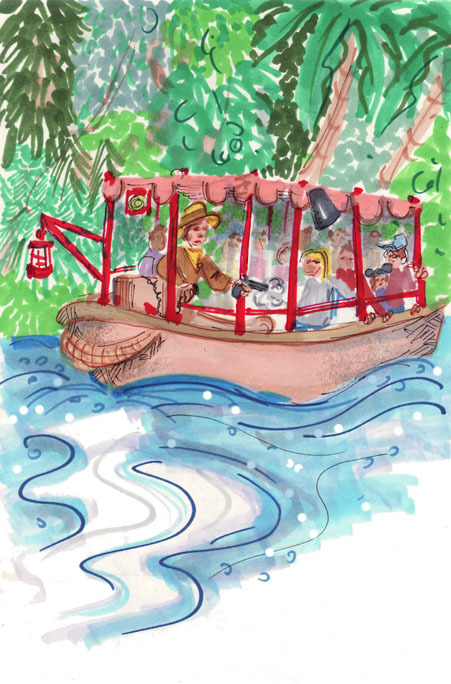 Ever wonder what it might be like if Disneyland’s Jungle Cruise had a Christmas overlay, too? No? Well I’m going to show you anyway, as I present. . .
Those of you adventurers now entering the world-famous Jingle Cruise, please notice there are two lines. The one on the right is for those on Santa’s Naughty list and the other on the left is for those of you who are Nice. Ma’am, I think you’re on the wrong line. Ladies and gentlemen, your attention, please. Would the party that lost their Christmas shopping money, a roll of 50 $100.00 bills wrapped in a red ribbon, please report to the turnstile … we have good news for you. We found your red ribbon. As you step into our Jingle Cruise boat, some of you might want to come sit near the engine and our Christmas chimney (pointing to the smokestack near the center cushion). We like to balance out the boat so when we sink, we go down evenly. Everyone turn around and wave good-bye to the folks on the dock we’ve left behind. Smile! They may never have a chance to unload that stale fruitcake on you again. I wasn’t always a Skipper here. 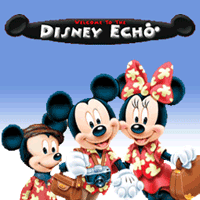 Before I came to the Jingle Cruise, I worked at NASA one Christmas season as an rocket repairman. But I left on medical leave because of a bad case of missile-toe. As we leave the last outpost of civilization, we travel deep into the mouth of the Irrawaddy river of Asia into a tropical Christmas rainforest. Feel that wetness on your faces? Yes, that’s rein-deer. Santa never could potty-train them. Look at all of the elephants out here in the water today! It’s okay to take pictures… they’re modeling the trunks they got last Christmas. All of those pachyderms in the water are wading for tonight’s visit from Elephanta Claus! My friend @mainstreetjake warned me to be on the lookout for gorillas in the mist. Uh-oh, remember what Ralphie’s dad said? Those gorilla’s don’t. They’re gonna shoot their eyes out! Every year at this time, one of those gorillas likes to beat his chest and swing from Christmas cake to Christmas cake. We call him Tarzipan! And now, we’re approaching the beautiful Schweitzer Falls, named after that famous African explorer, Dr. Albert Falls. And over there is a recreation of his beautifully-decorated Christmas tree, named after that famous African shrubbery, Dr. Albert Tree. We’ve turned onto the Nile River at Christmas time and if you don’t believe in Santa you must be in denial. Look at all the Christmas phants here on our Jingle Cruise! You can see the pachyderms are Christmas phants because they have no el (Noel). Our Jingle Cruise now brings us to the Africa veldt, where the tigers and cheetahs are awaiting a visit from Santa Paws. The lions are also in a festive mood, eating that zebra with their sandy claws. Don’t worry kids! Those lions are really just opening their Christmas presents. Look at that zebra-print gift wrap! My friend @mainstreetjake warned me that this is what happens when you drink too much egg nog! Look at the hyenas! They’re ho ho hoing their way to the naughty list! That rhino’s wearing his Christmas present: a new horn. The lost safari thinks it looks sharp on him. Uh-oh, the water wings those hippos got for Christmas are defective and need to be returned: They’re blowing bubbles! Don’t worry, the hippos only charge when they’ve used up all their Christmas cash. We’re entering headhunter country now. The skeletal remains of my last crew are over there in that canoe. They always enjoy Christmas — they’re still smiling. We’re deep in headhunter country now. That shrunken head is sad he couldn’t go to the Christmas party. He had no body to go with. Beautiful Schweitzer Falls is upon us again. The overhanging rock formation will afford us a different view this time. I have a special treat for you, folks. You may never have seen this before… there it is: the backside of water! No we didn’t retheme that joke for Christmas. Christmas is the time to repeat favorite things. And if you don’t believe me you must be in denial. Don’t make me go back there! Ah, there’s Trader Sam! When Trader Sam was a boy, his parents wouldn’t let him have a dog for Christmas. They made him eat elves like everybody else. Last year Trader Sam had grandma for Christmas dinner. She was a bit dry and leathery so he used plenty of grave-y. One year over the holidays, Trader Sam gave up eating meat and tried the Christmas tree diet. You guessed it, he got tinsel-itus! One chilly Christmas day, Trader Sam almost missed Santa… only got a cold shoulder. And now, probably the most dangerous part of our journey- the return to last-minute Christmas shopping! If you enjoyed the time we spent together, this has been the world-famous Jingle Cruise. If not, this was it’s a small world holiday. My thanks to Danielle @DeeMagicGurl and Jake @mainstreetjake for the inspiration of this column. Illustration by josh pincus is crying.